I will admit...I was singing "It's Finally Friday" when it came on the radio and I am happy it is Friday! It's been a good week, but a very hyperactive week for a certain few in my room. This week we have started our astronomy unit and our focus has been on the sun. Our big question is "How does the sun affect the Earth?" First, we started off by discussing what we already knew about the sun and we created a KWL chart. 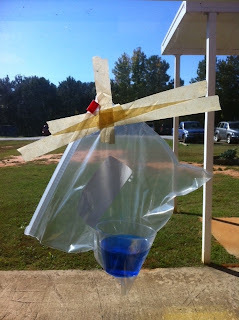 Then, we began an experiment to find out if the sun affects the water cycle. 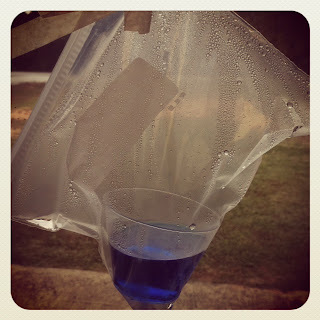 We took 4 cups and put the same amount of water in them and used masking tape as our first marker of the water lines. 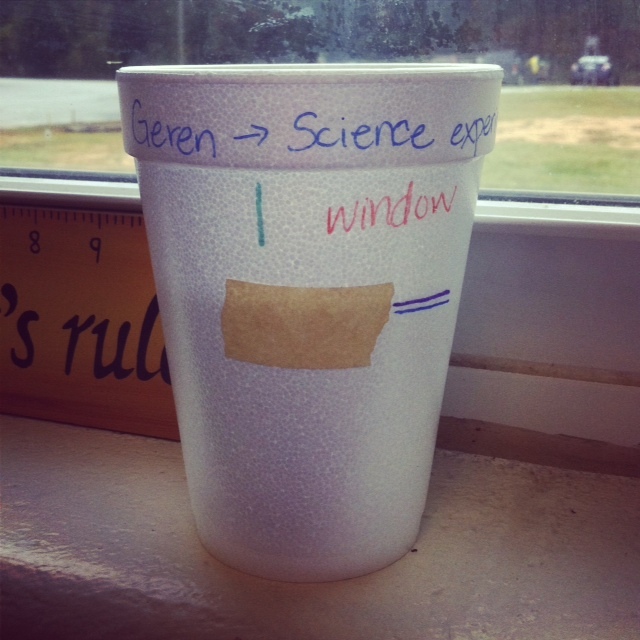 We put one cup in my classroom by the window, one in my room away from the window, one in the refrigerator, and one outside in direct sunlight. We also have kept up our mini water cycle activity. Here is what it looks like now! Here is just a random shot of my room this afternoon! On the students desks are some papers (mostly tests) for the students to file Monday morning and a weekly newsletter for next week. I was so excited about today's theme for Red Ribbon Week: patriotic or military day! My father-in-law is a retired Colonel so I wore one of his uniforms! I even had his name tag to show my last name and his colonel badge. The kids LOVED it and called me Colonel Geren most of the day! He let me borrow money that he's gotten from several places like Saudi Arabia, Afghanistan, & England. My students loved that! I showed them pictures of him from when he served in Afghanistan. They enjoyed it and I enjoyed bragging on him! The picture was taken with my phone so it's not the best quality. Today was Tacky Day at school for Red Ribbon Week! Normally this isn't my favorite day, but I wanted to participate and the kids LOVE it when teachers dress up. Here's my outfit! Do you dress up on days like this at your school?! In Social Studies we are learning about what life was like during the colonial days. Today we learned about characteristics of colonial schools and colonial foods. Our book tells us about a colonist who wrote about an apple pie that had apples that hadn't been peeled or cored and crust that was so hard a wagon wheel wouldn't break it. So, every year I make an "easy apple pie". The recipe is SO easy and it doesn't taste half bad. You take 2 cans of apple pie filling and put in a pan. Cover with bread (no crusts). Mix together 1 stick of butter (melted), 1 cup of sugar, and 3 tablespoons of flour and cover bread. 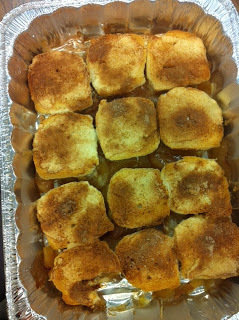 Sprinkle cinnamon sugar on top and bake at 350 for about 35-40 minutes. I always tell my class "It may not be the best apple pie, but it can't be as bad as the apple pie they ate in colonial days! One little girl LOVED it and said she wished she lived in the colonial days because my apple pie was delicious. Bless her heart! Today was "Team Up Against Drugs" so I wore an outfit for my favorite team, the University of Tennessee! GO VOLS! Just a quick funny about the apple pie. 1) Take my advice and don't try to make it at 5:00 am when you are barely awake. Somehow 3 tablespoons of flour turned in to 3 cups of flour in my mind and then I realized something was NOT right! 2) If you happen to not have butter, it still tastes fine. After my flour fiasco, I didn't have any butter left but I just went without it and it was fine! I wanted to share a Math activity that my kiddos always enjoy! We call it "Candy Math". Since we don't have a Halloween party, we have a candy Math lesson near Halloween. I ask the students to bring in individually wrapped candies. Thankfully, one student brought it a TON of candy, like $30 worth! First, I split the students into 4 groups and let them choose one bag of candy to explore. Each group got a post-it and wrote an estimate of how many pieces of candy they thought was in their bag (using the nutrition label serving size and servings per bag as a guide) and then they counted their actual number. We used the 4 groups numbers and discussed median, mode, range, maximum, and minimum. I was a little surprised that the children didn't know any of these terms! One student got maximum, but other than that there was very little background knowledge. 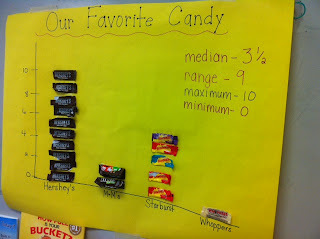 Then, I had the students take 1 piece of their favorite candy and eat it, but keep the wrapper and we made a graph. We used that information to find the terms listed above! Next week we have Red Ribbon Week where we have dress up days everyday! 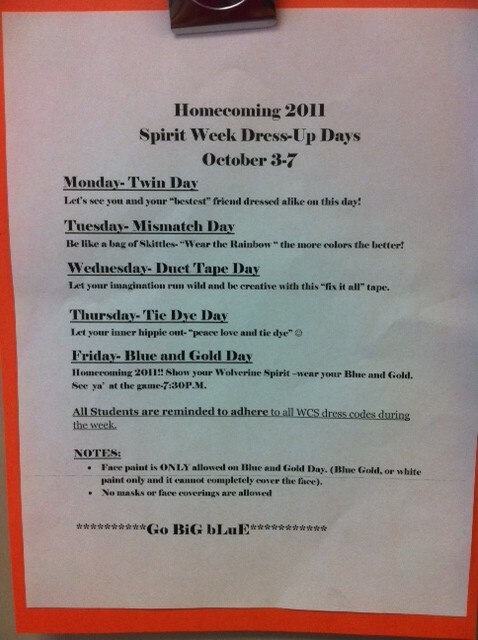 I'm excited for the dress up days! They're fun and the kids LOVE it when teachers dress up. I didn't do too good on Homecoming week so I am making up for it Red Ribbon Week. We always have a door decorating contest, but this year it didn't have to be on your door. 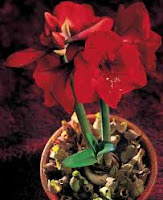 It could be a display in the hallway. 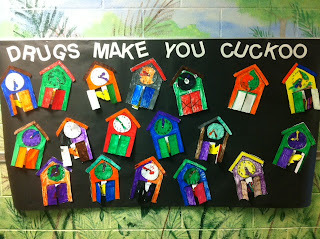 I always let my class vote on how we decorate and this year they voted "Drugs Make You Cuckoo". I was hesitant that we could pull it off but I found a cuckoo clock template online that we used. I think it turned out SUPER cute! 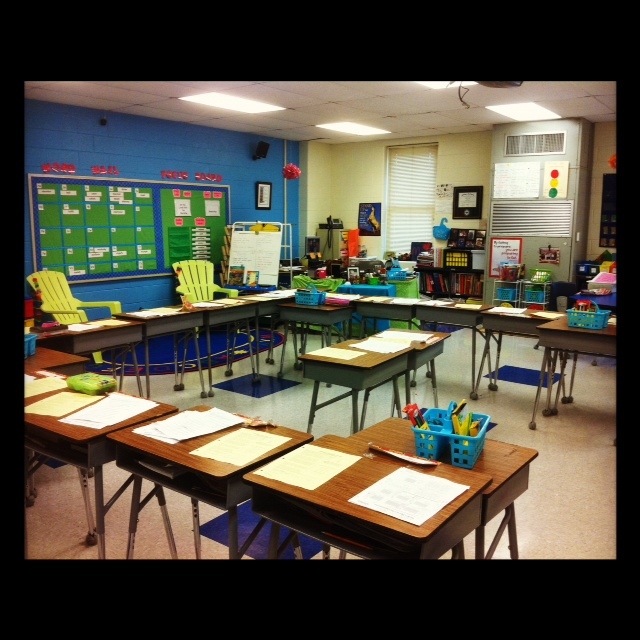 I had 3 students absent so there's a few places that have a spot open. Thursday - I can't remember the slogan, but we wear red! 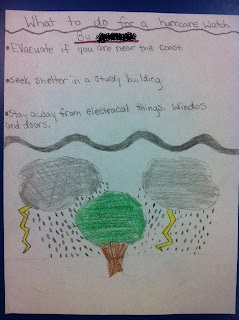 I wanted to share a mini water cycle activity that my class is doing right now. I can't take credit for it, my partner teacher introduced it to me several years ago and we do it every year. Pour water (I add blue food coloring) into a small container and place in a ziploc bag. Mark your water line. Tape the bag to a window that receives sunlight. I have my students divide a page in their science notebooks into four blocks and label "Day 1", "Day 2", "Day 3", and "Day 4". On Day 1 we draw what you see here. On Days 2, 3, and 4 the students make an observation, draw what they see, and write a sentence or two underneath about what they noticed/observed. I've had my students do their observations as an early finisher throughout the morning and then we all discuss during Science. The water cycle is something the students usually really "get", but actually seeing it...it always interests them! I usually leave it in the window after our day 4 observation just so they can continue to see our mini water cycle! This week we wrapped up a unit on severe weather! 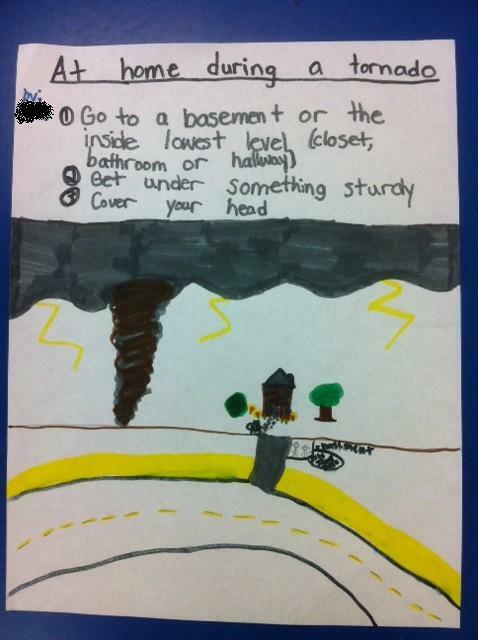 Kids are almost always really interested in severe weather. 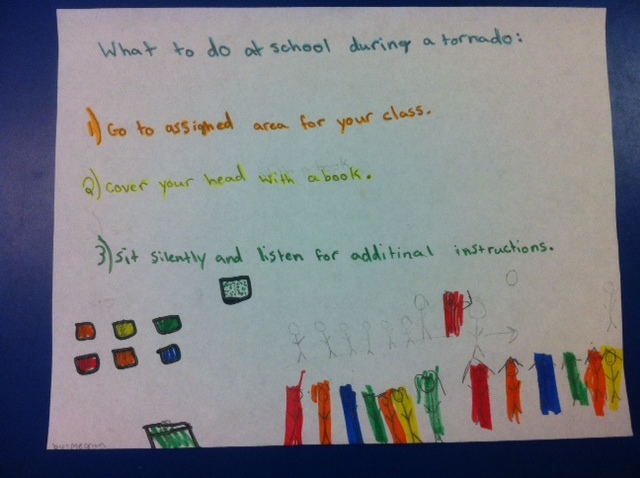 We focus mainly on hurricanes and tornadoes. 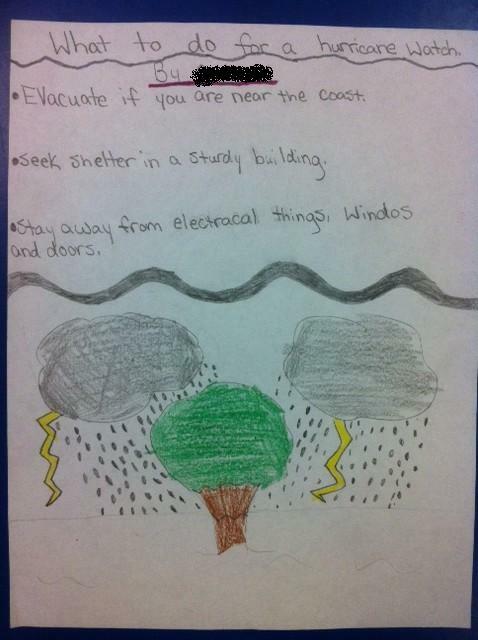 We watched several videos and made severe weather posters! Kids love doing any kind of drawing! At one of my PD meetings on Monday we focused on Math and discussed how sometimes there are children who still don't know their basic addition facts by 4th grade. Sad, but true. I can't tell you how many children I see still add on their fingers. 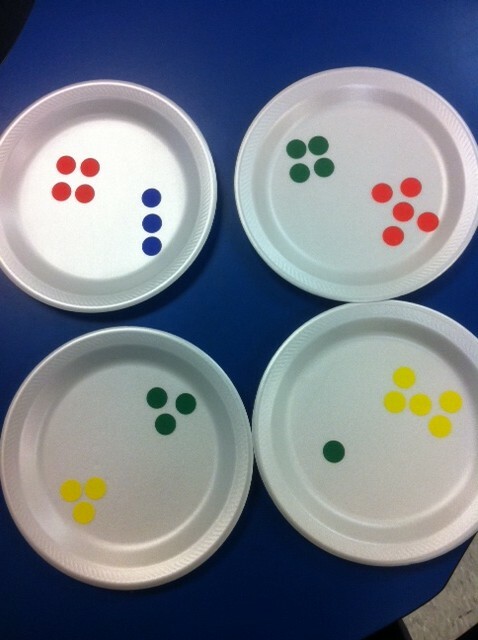 So, we talked about a few addition games that we can use in our classrooms. These can be used as a review or in lower elementary grades. First, take stickers and put two sets on a paper plate. Hold the plate up and the students have to add the stickers mentally. Another game comes from the Everyday Math series, which we used several years ago. It's called Addition Top It. 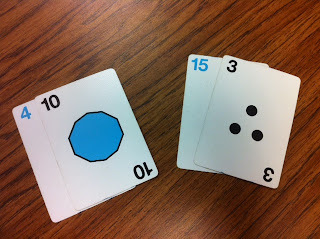 Students use number cards (since we aren't supposed to call them "a deck of cards" anymore!) and draw two. They add the two numbers up and whoever has the highest number gets both cards. For example, here one player would have 14 and the other played would have 18 so the player with 18 would get all 4 cards. I've done this same concept with Subtraction Top It and Multiplication Top It. During our enrichment classes, our groups are separated by their previous PASS tests and I teach the lower group so this will be good for them. I hope to share some other Math games soon! If you've been wondering if I am still here, I am! We have been so busy at school and we went on a field trip to Cherokee, North Carolina yesterday! It's a big field trip for us...we ride on a chartered bus and drive out of state. Many kids see the mountains for the very first time. It's always so sweet when someone says, "Mrs. Geren, oh my gosh, there is a mountain!" Even though it seems so simple for me, I always act excited with them! First, we visit the Oconoluftee Indian Village. Then, we eat a picnic lunch and visit the Museum of the Cherokee Indian. We saw a Cherokee woman making a wampum belt. We learned how they make pottery. We saw a presentation of how they use a blow dart gun. The kids loved this! We saw many different styles of houses! We learned how to make a dugout canoe and what they were used for. Our picnic lunch went well. We have the kids pack their lunch in a gallon size ziploc bag (provided by us) and that's their "ticket" to get on the bus. We always have some parents complain that they want to bring something else, but here's what we tell them: 1) One year everyone brought lunch box and it took 2 teachers, 3 chaperones, and a golf cart to get all of the lunch boxes. 2) Another time a parent followed the bus and wanted to get her child a lunch somewhere on the way. Except she didn't make it to the field trip until an hour after lunch and they child have nothing to eat so the teacher had to share her lunch with the student. SO....we require a lunch packed in a gallon size bag AND we always pack an extra lunch! Next stop: Museum of Cherokee Indian. The kids couldn't believe how realistic this looked. Overall, we had a great time! The kids were all well-behaved! 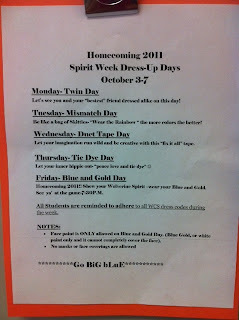 This week is Homecoming at our school so we have dress up days each day! Monday is Twin Day which is perfect because we just got our class t-shirts on Friday so we all decided to wear our class t-shirts on Monday to be twins! I'm not so sure about Duct Tape Day...have yall ever heard of that? It's the first time we've done it so I'm not too sure about it. I wish I had some pictures to share from this week, but I don't. It was a busy week with lots of things going on at school. A family lost everything they owned to a house fire (6 children in the house, 5 go to our school, 1 in 4th grade), another child lost their father and is having a really hard time, no Internet most of the week at school, and my son and I both are having sinus issues so we are just glad it's the weekend and we are hoping for a better week this week!